We are pleased to report that Slingshot 292 is now arriving with subscribers, and that we are almost back on schedule. There has been some confusion among members about just when renewal is due. Membership expiry is now noted on the address label you receive with your Slingshot. The formula is last Slingshot number - membership number, so if the first number is 291 this means that your renewal is due after Slingshot 291. 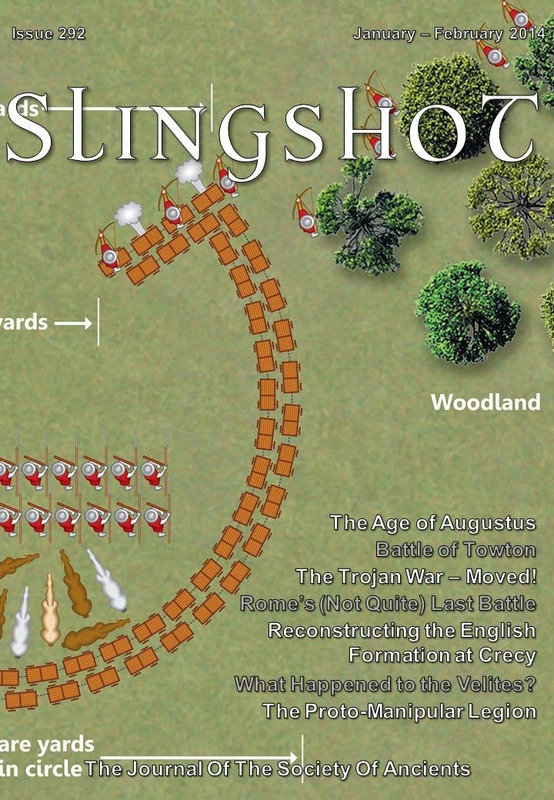 The editor (editor@soa.org.uk) is always interested in ideas for articles, so if you are a member or plan to become one and have a battle report or historical article, a review, rules ruminations, scenario or campaign ideas, or anything else you would like to contribute to Slingshot, feel free to contact him. The Society also has the 'Operation Balearic' sale on at present. Operation Balearic offers back issues of Slingshot at the bargain price of six for £5 (£4 for SoA members) plus shipping. That is a year's worth of Slingshots for the price of one magazine. The bundles on offer are for the years 1982, 1983, 1984 and 1987, and for each year from 1996 through to 2010. This offer is only available for a limited time and while stocks last. To order, go to the Balearic Bundles page in the store section of the Society of Ancients website. For a summary of the articles in each bundle, see this post on the Society News blog.